A keyword search of A.S.K. puts 25,000 documents and other ALHFAM resources at your fingertips. A.S.K. is a digital information system that unifies and shares an extensive collection of reference works, training materials and other resources of the Association for Living History, Farm & Agricultural Museums. The system currently contains all of the articles from the ALHFAM Proceedings (published versions of presentations from our Annual Conference), and all ALHFAM Bulletin articles from 2005 to present. 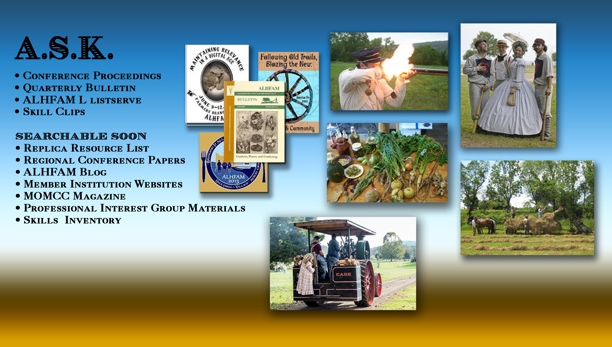 It also includes the content of the ALHFAM website, the complete archive of the ALHFAM-L (our e-mail discussion list), and material provided by ALHFAM members such as Tiller's International and Howell Living History Farm. A.S.K. will soon contain regional conference presentations, Professional Interest Group materials, the ALHFAM Replica Resource List and video clips recorded during skill training programs and workshops. Keywords help you narrow down the specific content that you produce in a search for information in the ALHFAM Skills- & Knowledge-base (ASK) system. You can search on a single word or multiple words, but the results will vary depending on the way you submit the search. When you enclose a phrase in quotation marks, your search returns content within the chosen scope that contains the exact phrase that you typed. If there is any variance between the phrase in quotations and the actual content, the content will not be found. A search with "first-person interpretation" will not find first-person, interpretation or first-person interpretations. For example, you might be looking for content with the term agricultural museums, but you don't want to find the term when it appears in the written-out title of ALHFAM. When you use the phrase agricultural museums NOT "Association for" you can narrow down the number of items returned, since you are eliminating any documents that contain the phrase Association for. Operators (for example, Boolean operators) – such as OR and AND — should be written as all uppercase. When two words are specified with no operator, an implied AND exists. For example: period clothing is the same as period AND clothing. AND Find content that contains all of the words or phrases it separates. fireplace AND cooking AND hearth finds content that contains all three words. OR Find content that contains either of the words or phrases it separates. cooking OR hearth finds all the content that contains either word. NOT Exclude content that contains the term within a phrase. cooking NOT hearth finds all the content that contains the phrase cooking, unless the content also contains the term hearth. NEAR(n) Finds words that are near each other, where n equals the number of words apart. If no number is specified, the default distance is 8 words. hearth NEAR(5) cooking finds hearth cooking, and open-hearth cooking, and fireplace hearth-based fireplace cooking. Once a search has been entered, and the results returned, you can select what types of documents you wish to view. On the left-hand side of the page there will be a menu tiled Result type. Below this you can then click the document type, e.g. Web page, or PDF. Then you will only see those that are in the format selected. All Proceedings and Bulletin articles are available as PDFs, so if you are searching for information from articles choose that option to restrict your search.